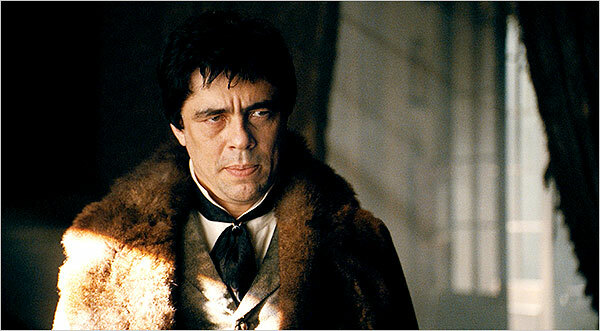 Benicio Del Toro is Lawrence Talbot, a star of the stage and the estranged son of British Lord (Anthony Hopkins) who returns home to after being raised by distant relatives in America, only to find his brother murdered (either by beast or animalistic madman) and his father is a state of what appears to be dotty denial. While thereâ€™s some narrative explanation behind Dadâ€™s odd behavior, the bloodless performance owes less to dramatic motivation and more to the lazy mechanics of Hopkins going through the motions of a performance. Not that Del Toro offers much more as the distant, brooding Lawrence. Heâ€™s supposed to be haunted by memories of seeing his motherâ€™s suicide and the subsequent horrors of barbaric tortures at the asylum where he father had him placed but mostly he just looks uncomfortable under his period collars and coats and bored walking the lifeless halls and dusty rooms of a giant mausoleum of a home. His only motivation is to track down his brotherâ€™s killer and that almost ends his life when he chases the lupine monster on the moors. Thereâ€™s ostensibly a spark of interest in his brotherâ€™s fiancÃ©e Gwen (Emily Blunt) but even that seems more like a Gothic convention than an emotional reality: he gets even more stiff and formal around this beautiful young woman so he must interested. Blunt offers the only real life in this dead manor house, offering up compassion and concern for Lawrence in his recovery from the feral animal bite along with the obligatory anxiety of a haunted Gothic heroine. And thankfully Hugo Weaving brings a snap to his smart Scotland Yard detective with a sly humor and a sense of cunning. His wit is a lonely thing in this film. A month passes, the next full moon arrives and the inevitable transformation along with it. Yes, itâ€™s an America Werewolf in Blackmoor (and, later, in London too) and itâ€™s about time, for the wolf man himself is a magnificent creature. Where recent werewolf movie creations have been more beast than man and sometimes simply magnificent wolf (with the usual CGI enhancements), this is classic man-beast. Del Toro gets to act up a beastly storm of ferocious predator under a mat of fur and a full complement of canines tearing through a succession of human snacks, and only drops to all fours to gallop through the forest or leap across London rooftops like a jungle beast on the loose. Bringing Rick Baker on board (the man whose artistry made An American Werewolf in London a quantum leap in movie monster transformations) may be the only inspired decision in the entire film. In a film environment where digital creations too often stand in for the physical, Baker brings the craft of practical make-up and physical effects to the film and the mix of visual textures and human performance behind the hair and appliances creates a monstrous nightmare of a living beast. As long as the beast has control of the man, this film has some blood pumping through it. Joe Johnson has directed some passably entertaining films in the past, better with lighthearted fare than not. He rose to director from art director and production designer and special effects and thatâ€™s what a brings to this: a design for a movie in place of a story. He fills the gloomy town with colorfully abstract peasants and hard-bitten villagers, films the Talbot Manor like a haunted house, pumps fog through every nighttime scene, silhouettes his figures in the night with carefully calibrated backlights and sweeps through every transition with striking images that look more like TV commercials than portents of horror. He works overtime making it look like what he thinks Hollywood Gothic should be without creating characters worth caring about or offering a story to invest ourselves in. He canâ€™t even deliver the simple mechanics of storytelling. Between the London transformation and the climactic dogfight in Blackmoor, a month has passed (or at least should have passed, as thatâ€™s the span between full moons) yet the traveling montage is abstract, with no sense of time passing. For a guy who loves his time-lapse rising moon images, he canâ€™t even toss in a shot of the passing phases of the moon to mark the march of time. Given that he canâ€™t even build credible suspense in anticipation of a primal blood conflict, itâ€™s no surprise that the paternal twist of blood curse and children sacrificed for the unholy pleasures of unleashed savagery has no resonance, let alone tragic dimensions. This battle of the beasts is just another dogfight in a wolfpack of two. Lon Chaney Jr. lumbered through the original The Wolf Man with the effort of a limited actor trying to open himself up to the torture of a man who cannot stop himself from killing except by dying himself. In the process created a tragic everyman through a performance expressive beyond his limitations, with haunted eyes and a palpable fear in his face as he watched the full moon rise. We felt his terror. Del Toro, an infinitely superior actor, fails to elicit the slightest sense of terror, tragedy or any human feeling. Heâ€™s a blank in every way. Only when heâ€™s howling at the moon in full on predator mode does Del Toro, and the film, come alive. The rest so stiff and bland and colorless and at time laughably directed that you want to howl at the screen. Directed by Joe Johnson; screenplay by Andrew Kevin Walker and David Self, based on the script by Curt Siodmak; featuring Benicio Del Toro, Anthony Hopkins, Emily Blunt, Hugo Weaving, Antony Sher, Art Malik, Cristina Contes, Geraldine Chaplin. Do you think it would have come out with more life if they had kept mark romanek? Those kinds of predictions are easy to play and impossible to verify. I think Romanek has shown a more complex vision of human nature and behavior than Johnson has, but I would never describe his films as lively or exciting. And he’s only got two small, low-budget features to his credit, so it’s hard to assume anything about how he would take a studio film/ “The Wolfman” has been delayed numerous times so it’s likely that the studio came in and tried to “fix” it, with as much success as any other fix I can think of. But I don’t know and I can’t second guess without knowing more details. All I know is that this is pretty bad.